First... how unusual is the cherry finish? I haven’t seen any. It seems these are usually sunburst. I think you're right, I don't think Cherry was that common, that early. While looking for clues of a possible re-fin, in the "full frontal" photo, the shade strikes me as "correct" although just a wee bit "blotchy". That could be just due to lighting and the 'hog top, though. The headstock face is simply "unfinished", no lacquer was applied after faceplate was removed. The more I look though, the more I think it's original finish. Would rock it on a regular basis. DThomasC, the luthier working on this for me thinks the paint isn’t original. It may have been repainted early in its life. He’s going to refret it and take care of a coupl other smaller issues. I’ll check with him to see what he thinks. I had a '58 M-65 a few years ago, and I'm somehow thinking that these guitars (at this time) just had a painted/lacquered headstock with a stencilled logo. Please correct me if I am wrong, of course. Last edited by dapmdave; 11-27-2018 at 12:40 PM. I owned an red mahogany M65 with Franz pickup years ago. I think it was a 1960 model. Unfortunately I can't recall the headstock. I used to think red mahogany M65's were rare and that may have been true in the 1950's. However a few years back a number of red mahogany models from the 60's became available. Over that time I picked up three different red 'hog M65's and my brother also found one. Two had the chrome soapbar single coil from '63/'64 period and one had a Mickey mouse single coil. My brother picked up a red 'hog with a stock single Franz pickup that someone modified with addition if a 2nd Franz. I also spotted a few more for sale. So I thought the red mahogany M65's were rare but now I think a fair number of them are out there. Well, my thought was that mahogany tops with red finish started with the Starfire line, which didn't appear until 1960. In other words anything with a mohagany top and red finish before 1960 would be rare. But yeah, mid to late 60's M-65s can be found that way. I just got this baby back from the luthier’s. He re-fretted it, did some bridge work (kept it all original, just tweaked it), and cleaned up the pots. This plays like butter now. He thinks it was definitely refinished a long, long time ago. It looks like it has a maple top. Everyone who saw it at his shop wanted to buy it. Great tone. I love this guitar!!!! Wow, somehow I'd missed this thread. Welcome Vermonter, and thanks for the pics. That is a really cool old Guild! 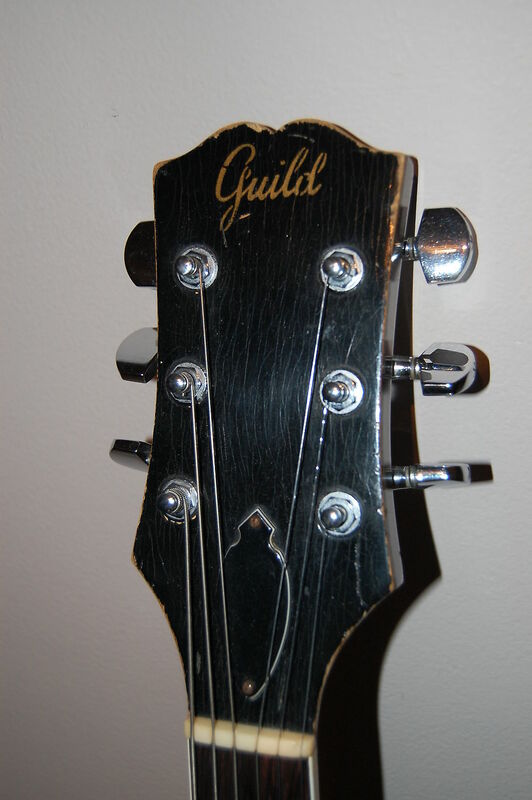 Guild used a headstock overlay that sometimes shrank. Sometimes the fix was to just take it off and the overlays came with it. That was for the guitars with black celluloid headstock veneers only. the black overlay with script logo was removed from the headstock. No. That model never had a overlay/veneer. It was just black paint with a gold paint logo. Now the black NC lacquer over time just fell off! With changes in humidity and temperature the wood works and nitrocellulose lacquer is forever gassing off and when it finally lost a good amount of its solvents it is simply chipping and flaking away from the wood!